You can obtain an instant rate quote and even book securely online through the VRBO-Homeaway reservation system. We update our calendar daily and our rates are adjusted to reflect the season. Well behaved dogs are welcome to stay at Bear Necessities Cabin. Your $100.00 refundable damage deposit will cover him/her. The deposit will be refunded within 7 days after departure if there is no pet related clean up, excessive human related clean up, damages or missing items reported by the cleaner. Please EMAIL ALL QUESTIONS. I will respond quickly. Thank you very much for your interest in my cabin. If your looking for a special place to relax and enjoy your visit to the Great Smoky Mountains Bear Necessities is the cabin for you. LOCATION: Between Gatlinburg and Pigeon Forge off of US 441 (Gatlinburg Spur). Gatlinburg-4.5 Miles Pigeon Forge-2 Miles Great Smoky Mountains National Park entrance-4.0 Miles. 15 Minutes or less from all area attractions including Dollywood, hundreds of restaurants, amusement centers and shopping outlets. BEAR NECESSITIES is an exceptional cabin that sleeps up to 4 people. It is located in the highly desirable Sky Harbor area which is far enough off of the beaten path to enjoy the peacefulness of the Great Smoky Mountains but close enough to be at all the area attractions in just minutes. “Bear Necessities” is perfect for honeymooners, couples and small families. Amenities include HD Cable TV, WI FI INTERNET Gaming Loft with POOL TABLE, ELECTRONIC DARTS, PING PONG, TABLE HOCKEY and BASKETBALL CHALLENGE GAME. FREE UNLIMITED LONG DISTANCE, DVD PLAYER in the living room, WHIRLPOOL in bedroom and 4 person HOT TUB is enclosed in screen and covered on the back deck. Updated furnishings throughout. GAS FIREPLACE (seasonal), fully equipped kitchen with beautiful granite counter tops and refrigerator with ice maker. There is even a Keurig coffee maker. We have added a 6 qt. crock pot so you can prep your meal in the morning, explore the area and come back to a great home cooked meal without the fuss. There is a charcoal grill for outdoor cooking.. This cabin is professionally cleaned by the same person I have been using since 2008. The hot tub is drained, cleaned, sanitized and refilled after each guest. I have very capable maintenance people available should you experience any issues during your stay. NOTE: There is limited walking area for pets. This is a mountainous terrain and this cabin has a small grassy area out front. Leashes are highly recommended. Keywords: BEAR NECESSITIES CABIN Luxury Cabin, Pet Friendly with NO pet fee. Wi Fi, HDTV, Game Loft, Gas Fireplace, Gas Grill, Hot Tub, Whirlpool Tub, Wooded View, Romantic. Convenient to all area attractions. A native of East Tennessee I now live in Savannah, Georgia. For all of the beauty that Savannah has to offer it does not compare to the splendor of the Great Smoky Mountains. Bear Necessities is a beautiful and wonderful place to stay. When we stay at Bear Necessities it is very hard to leave. Most of our guest say the same thing. I fell in love with Bear Necessities as soon as I saw it. I told my real estate agent to do the deal immediately, without hesitation and I have had no regrets. This peaceful setting is one that is very hard to leave once you have spent some time there. Peacefulness. It is so relaxing. I find it interesting that most of my guest to Bear Necessities rarely ever leave the cabin. It is close enough to the area attractions but once your there it really is hard to leave. Has a full sized tub shower combo plus whirlpool in master bedroom. Gas fireplace operable during the colder months only. Has its own secure Wi Fi. Keurig and regular coffee makers. Full cable with HDTV in living room. Covered front porch and private rear deck overlooking the woods. Private hot tub inside screen enclosure overlooking the woods. Decorated in Mtn. Bear theme. Great location near US 441 and minutes to everything. Paved roads all the way to the cabin. From beginning to the end of our trip everything was perfect. Home was clean and furnished with all the amenities. 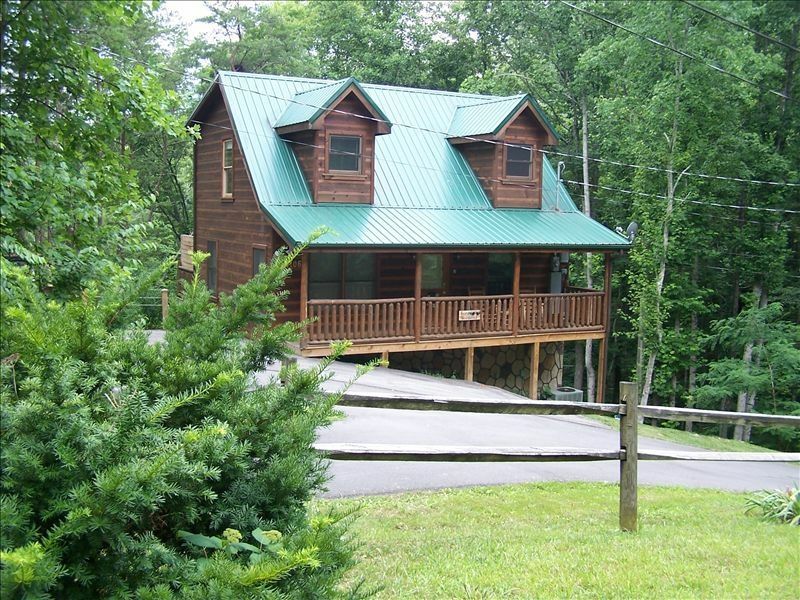 Very convenient to Gatlinburg and pigeon forge! We will be back!! Great stay at Bear Necessities! My family of 4 had a great stay at Bear Necessities. Great location with easy access to Pigeon Forge and the Gatlinburg Bypass. Well equipped with all the essentials and the kids especially enjoyed the game room and hot tub. Being able to bring a pet was an added convienience. This is the second time I've rented from this owner in 2 years and would not hesitate to do so again. Highly recommend a stay at any of his properties. Thank you! Look forward to our next stay already. Thank you so very much for staying at Bear Necessities Cabin. I hope that you will visit again sometime soon. The cabin was a welcome retreat from work, kids and dogs. We thoroughly enjoyed ourselves. Thank you. Thank you very much for staying with us. I hope that you will visit again sometime soon. Thanks so much for staying at Bear Necessities Cabin. I hope that you will come and visit again sometime. Quaint Cabin in the woods! Perfect for couples! We stayed for 4 nights and thoroughly enjoyed our stay. Everything was exactly as described.. Conveniently located between Gatlinburg and Pigeon Forge, only about 12 mins to either town. We had a peaceful 4 nights and would definitely return! Would highly recommend! Thank you very much for staying at Bear Necessities Cabin and for your kind words regarding your stay. I hope you will visit again sometime soon. Great location. Enjoyed hot tub. Nice clean cabin. In need of minor maintenance. Thank you for staying at Bear Necessities Cabin and for reporting the maintenance issues. I will have those addressed. The Great Smoky Mountains National Park, Dollywood Amusement Park, Dollywood's Splash Country, Ripleys Aquarium of The Smokys, The Old Mill at Pigeon Forge, Mini Golf, Bumper Boats, Go Carts and other Amusement Centers, The Glades Arts and Crafts Community where Craftsmen make their own wares all within 6 miles. Harrah's Casino, Cherokee 35 MI. Cades Cove 35 MI, Gatlinburg Convention Center 6 Miles, Douglas Lake, 15 MI, University of Tennessee 40 MI Rocky Top Sports Venue 4 miles away. Rates are subject to change until reservation is confirmed. All deposits paid are refundable and returned within 5-7 days after departure provided there are no excessive clean up, damages or missing items. I will consider a shorter term than the minimum stay requirement for certain circumstances. Email and ask. I do take online bookings but I do require a rental information form from all guest. Rates are plus 7% State Sales Tax, 3% Sevier County Hospitality Tax and a $55.00 cleaning fee.